Model - Smith & Wesson M-586 4 "
Model Smith & Wesson M-586 is for training and recreational shooting. 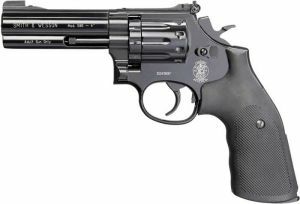 It is a replica of the martial revolvers M-586 .357 caliber Magnum. Typical for it is charging 10-mini-drum, which is placed between the barrel and drum fictitious. The capsule is placed in the handle and it can produce up to 50 shots. There are two versions of this air pistol length barrels 152 and 203 mm.